The Holiday Inn Express Boulder Hotel is an all Non-Smoking, beautifully appointed hotel in North Boulder 4.5 miles from the University of Colorado and 5 miles from IBM, Lockheed Martin, Northrop Grumman and the Gunbarrell Business Park. 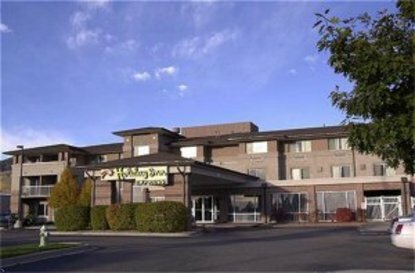 The Boulder Holiday Inn Express is located within minutes of Boulder Reservoir and 1/4 mile from Wonderland Lake Hiking Trail and other great hiking trails for the outdoor adventurous. We feature a Complimentary Deluxe Continental Breakfast with signature hot cinnamon rolls, hard boiled eggs and a Local Specialty Station that includes some Hot Food Items. Free local phone calls, Complimentary Wireless High Speed Internet Access & a Business Center to fit your needs. Airport transportation is available through Boulder Super Shuttle. Free wireless high speed Internet access, two 2 line phones, refrigerators, microwaves and coffee makers in all rooms. The Holiday Inn Express is conveniently located 3 miles from the Pearl Street Mall area and downtown Boulder. We are pet friendly with a fee. Visit Boulder, CO and stay smart at your home away from home the Holiday Inn Express Hotel. This hotel is committed to providing accessible facilities under the American Disabilities Act. If your accessibility needs are not met, please contact the Hotel Manager on Duty. Should you require additional information regarding accessible facilities for guests with disabilities, please call 1-800-Holiday (U.S. and Canada) or contact the hotel directly. For the hearing impaired, TDD service is available at 1-800-238-5544 within the U.S. and Canada.